Objective: To examine the placebo effect and its potential determinants in the treatment of osteoarthritis (OA) via a systematic literature search of Medline, EMBASE, Scientific Citation Index, Cumulative Index to Nursing and Allied Health Literature (CINAHL) and Cochrane Library. Methods: Randomised placebo controlled trials in OA were included. The placebo effect was defined as the overall change from baseline in the placebo group. It was estimated as the effect size (ES; the standard mean difference between baseline and endpoint) and this was compared with the ES obtained from untreated control. ES for pain was the primary outcome. Statistical pooling was undertaken as appropriate and 95% CIs were used for comparison. Quality of trials was assessed and potential determinants of placebo effect were examined using multiple regression analysis. The partial regression coefficient (β) was used to present the adjusted size of the association. Results: We identified 198 trials with 193 placebo groups (16 364 patients) and 14 untreated control groups (1167 patients) that met our inclusion criteria. These included a range of therapies (non-pharmacological, pharmacological and surgical treatments). Placebo was effective at relieving pain (ES 0.51, 95% CI 0.46 to 0.55 for the placebo group and 0.03, 95% CI –0.13 to 0.18 for untreated control). Placebo was also effective at improving function and stiffness. The pain-relieving effect increased when the active treatment effect (β = 0.38, p<0.001), baseline pain (0.006, p = 0.014) and sample size (0.001, p = 0.004) increased, and when placebo was given through injections/needles (0.144, p = 0.020). Conclusion: Placebo is effective in the treatment of OA, especially for pain, stiffness and self-reported function. The size of this effect is influenced by the strength of the active treatment, the baseline disease severity, the route of delivery and the sample size of the study. Osteoarthritis (OA) is a prevalent condition in people aged over 40.13 14 Pain due to OA often requires long-term treatment. Despite availability of a large number of therapeutic options, including non-pharmacological, pharmacological and surgical therapies,15–17 effective treatments for OA are limited since many have only limited symptom-relieving effects.18 It is still unclear whether placebo is effective for OA and which factors may determine the size of such an effect. This is a common discussion point when a randomised controlled trial (RCT) fails to demonstrate superiority of active treatment over placebo.19–21 However, apart from speculation22 23 a systematic review of placebo effect in RCTs in OA has yet to be undertaken. The aims of this study were: (a) to determine whether placebo has clinical effects in the treatment of OA, by comparing outcomes at baseline and endpoint and by comparing placebo with untreated control; and (b) to examine possible determinants of the placebo effect in OA, by quantitatively analysing study variables such as trial quality (eg, randomisation, blinding and withdrawal), types of treatment, source of patients and baseline severity of the disease. A systematic literature search was carried out during January and February 2007 using Medline (1950–), Web of Science (1960–), EMBASE (1980–), Cumulative Index to Nursing and Allied Health Literature (CINAHL) (1982–), and Allied and Complementary Medicine (1985–). The Health Management Information Consortium (HMIC) and Cochrane databases (1998–) were also searched. The search strategies included (a) OA of the knee, hip or hand; and (b) randomised, placebo controlled trials. Any terms with regard to these two strategies were included, such as knee OA or gonarthrosis, hip OA or coxarthrosis; double-blind, single-blind trials. There were no language restrictions for this search. Citations and abstracts retrieved from this search were downloaded to Reference Manager V. 10 (Thomson Reuters, Philadelphia, Pennsylvania, USA) and duplications were removed. RCTs used to develop OA treatment recommendations for the European League Against Rheumatism (EULAR) and Osteoarthritis Research Society International (OARSI) 15–18 were also searched for placebo-controlled trials. Abstracts were read first to select the studies. Paper copies of the selected studies were then collected and examined to ratify study eligibility. Only placebo-controlled trials in OA of the hands, hips and knees were included. Trials including untreated control were also included as a comparator. Trials for other types of arthritis or for OA at other joints such as spine and foot were excluded. Studies of non-clinical outcomes, such as biomarkers, and animal models were excluded. A customised data extraction form was used to extract data. The following information was collected from each paper: study design (parallel or crossover); sample size (treatment, placebo and untreated control); mean age and SD; gender (female/male); mean body mass index (BMI) and SD; length of study (weeks); pain score at baseline and endpoint; target joint (hip, knee, hand); active treatment modalities (eg, paracetamol, non-steroidal anti-inflammatory drugs (NSAIDs), topicals, etc); study setting (e.g. hospital inpatient, hospital outpatient, doctor’s surgery or community); study sponsors (industry, charity or academic). Data were fully extracted and assessed by an investigator (JR) and a random sample of 10 were extracted and assessed by a second investigator (ACJ). Discrepancies were discussed and ratified by a third assessor (WZ). Potential variables were analysed against placebo ES using a multiple linear regression model. These included type of placebo (invasive = 1, non-invasive = 0), mean baseline pain score (0–100%), mean age (years), gender ratio (female/male), mean BMI (kg/m2) and number of patients in the placebo group. In addition, ES of active treatment, intention to treat (yes = 1, no = 0), source of patients (community = 1, hospital = 0), patient blindness (yes = 1, no = 0) and funding body (industry funded = 1, non-industry funded = 0) were included. The partial regression coefficient (β) was used to present the contribution of each variable. Results are reported with 95% CIs. A two-sided p value of ⩽0.05 was considered significant. StatsDirect V. 2.6.1 (StatsDirect, Altringham, UK) was used for meta-analysis and SPSS V. 14 (SPSS, Chicago, Illinois, USA) was used for regression analysis. In total, 4141 citations were retrieved from the systematic literature search. After removing duplications, 3791 citations remained; from these we identified 642 potentially eligible studies through reading the abstracts. After reading the full papers we subsequently excluded 444 studies (fig 1) and selected 198 trials that met the inclusion criteria for the analysis. These included 184 trials with placebo (6 trials with 2 different placebo controls), 3 trials with placebo and untreated control and 11 trials with untreated control. In total, 193 placebo groups (16 364 patients) and 14 untreated controls (1167 patients) were available for analysis (table 1). Figure 1 Flow diagram for study selection. The quality of trials was similar apart from blinding since this was inapplicable for trials with untreated control. Of 193 placebo-controlled trials, placebo was compared with a wide range of active treatments in patients with a mean age of 62 years, gender ratio (female/male) of 2.6, BMI of 29 and baseline pain of 55% (table 2). 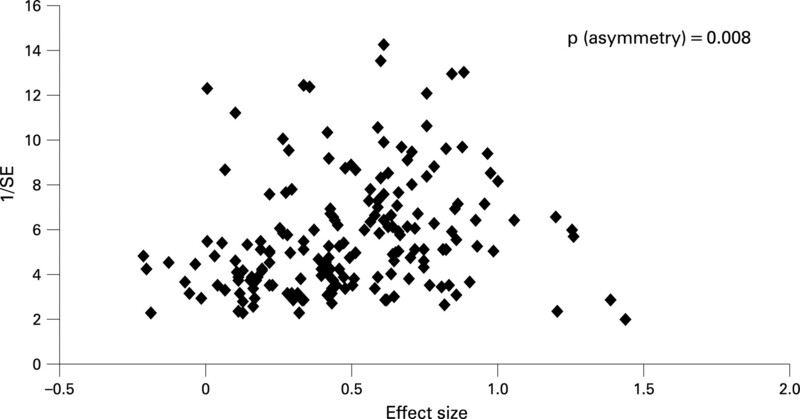 The funnel plot of the ES for pain in the placebo group showed an asymmetric distribution (p = 0.008), suggesting that the trials with smaller placebo effect were more likely to be published (fig 2). The overall estimate of the ES for pain was 0.51 (95% CI 0.46 to 0.55) for all trials (n = 193). The ES was 0.71 (95% CI 0.64 to 0.78) for trials that did not allow rescue medications (n = 15). This effect was significantly superior to the effect observed in all 14 untreated controls (ES 0.03, 95% CI −0.13 to 0.18). The results were supported by the head to head comparison within the three trials that included placebo and untreated control (fig 3). The ES for pain was 0.77 (95% CI 0.65 to 0.89) for the placebo group and −0.08 (95% CI −0.65 to 0.48) for the untreated control (fig 3). Of these three trials, one used intention to treat analysis. The ES for pain was 0.84 (95% CI 0.69 to 0.99) for the placebo group and 0.26 (95% CI 0.10 to 0.46) for the untreated control. Figure 2 Funnel plot of the placebo effect for pain. SE, standard error. Figure 3 Effect size between placebo and untreated control. 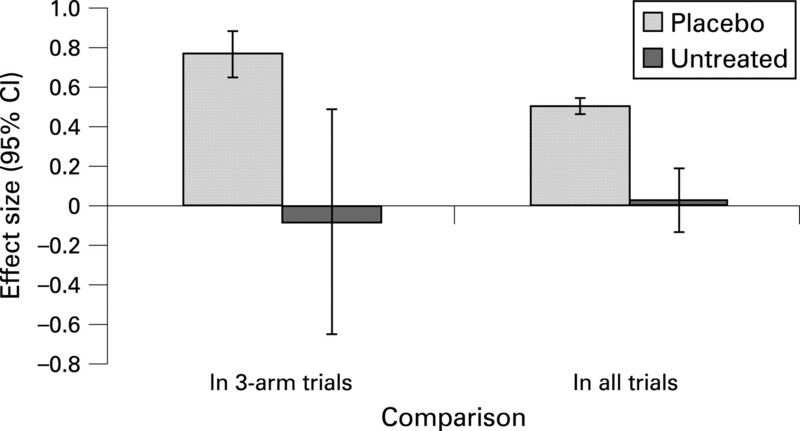 In three-arm trials: direct comparison between placebo and untreated control within the three trials that included placebo and untreated control, In all trials: indirect comparison between all placebo (n = 193) and all untreated control (n = 14) from different trials. The ES of the placebo group varied between treatments. Apart from placebos to laser and intramuscular (IM) glycosaminoglycan peptide, all had significant ES above zero. Placebos of acupuncture and intra-articular (IA) hyaluronan had effects above the average value of 0.51, whereas placebos of laser, magnets, food supplements (vitamins, milk, fish oil, etc), herbal remedies and bisphosphonates had effects below the average (fig 4). Most of the treatments involved multiple doses. However, of seven trials for IA steroid injection, six were single-dose studies with observational periods ranging from 1 week to 26 weeks,29–34 whereas one was a multiple dose study with one injection every 3 months for 26 months.35 The ES was 0.34 (0.11 to 0.56) for the single-dose placebo injection and 0.63 (95% CI 0.15 to 1.12) for the multiple-dose placebo injections. Figure 4 Placebo effect for pain categorised according to active treatment. IA, intra-articular; IM, intramuscular; NSAID, non-steroidal anti-inflammatory drug; TENS, transcutaneous electrical nerve stimulator. While 174 trials (14 782 patients) appeared successful in blinding patients from placebo (patients did not know whether they were given placebo or active treatment), 6 trials (194 patients) failed to blind patients (patients knew they were given placebo). Blinded placebo had a greater effect (ES 0.52, 95% CI 0.47 to 0.57) than open placebo (ES 0.30, 95% CI 0.10 to 0.50) though this difference was not statistically significant. Placebo was more effective in studies of hand OA than in hip and/or knee OA (fig 5). The ES decreased consistently from hand OA studies, to knee OA studies, to combined hip OA and knee OA studies and then to hip OA studies (p = 0.007) (fig 5). Analysis of studies that examined the same treatment (coxibs, cyclo-oxygenase 2 inhibitors (coxibs)) at different joint sites showed a similar trend with ES of 0.96 (95% CI 0.75 to 1.17) for hand OA (1 trial with 196 patients), 0.66 (95% CI 0.56 to 0.76) for knee OA (14 trials with 2456 patients), 0.57 (95% CI 0.28 to 0.86) for combined knee and hip OA populations (9 trials with 963 patients) and 0.36 (95% CI 0.21 to 0.52) for hip OA (2 trials with 336 patients) (p = 0.048). Figure 5 Placebo effect for pain for different sites of osteoarthritis (OA). Multiple regression analysis demonstrated that the placebo effect increased significantly with increase in the active treatment effect, baseline pain severity, invasive route of delivery (acupuncture, injection and surgery) and sample size (table 3). Placebo appeared to be effective for all patient-related subjective outcomes such as pain, stiffness and self-reported function, with moderate ES (0.43 to 0.51) (table 4). A greater ES (0.66) was seen for subjective observer-related doctor’s global assessment. By contrast, placebo was not effective for the more objective outcomes, except for timed specified walking distance, for which placebo showed a small ES (0.22, 95% CI 0.08 to 0.35) that was significantly inferior to placebo ES for pain in the same studies (ES 0.51, 95% CI 0.36 to 0.65). In studies of pain plus structural modification, although placebo significantly reduced pain from baseline to endpoint (ES 0.44, 95% CI 11.0 to 0.46), it did not stop joint space narrowing from baseline to endpoint (ES 0.32, 95% CI 0.17 to 0.46 for joint space width). Although there is a large amount of literature on placebo effects, this is the first study to systematically review the placebo effect in OA. There are multiple treatment options for OA (non-pharmacological, pharmacological and surgical therapies)15–18 and a range of outcomes that include subjective (eg, pain) and objective (eg, radiographic joint space width) measures. The majority of OA treatments have been tested formally in randomised placebo controlled trials. This allows an excellent opportunity to explore the placebo effect and its determinants in OA and to compare the magnitude of the placebo effect relative to active or no-treatment comparators. 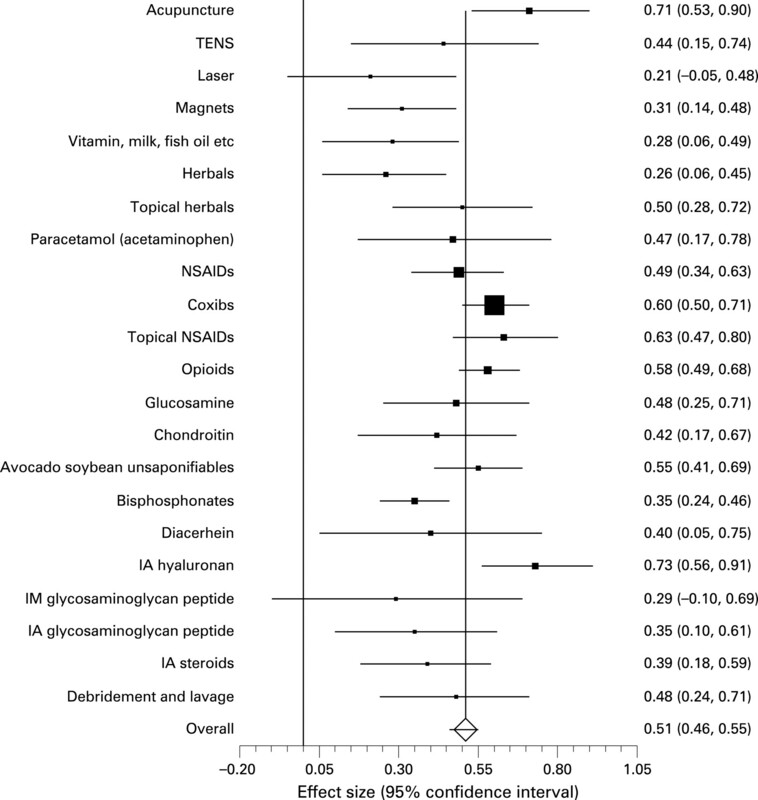 This meta-analysis has yielded three key findings: (a) placebo is effective for OA; (b) the effect is superior to non-treatment and is most effective for subjective outcomes; and (c) the major determinants of the placebo effect in OA are the effect size of the active treatment, the baseline symptom severity, the route of delivery and the sample size. Since Beecher’s claim of “The powerful placebo”36 there has been considerable debate as to whether the placebo effect exists at all. One key issue is that the definition of placebo is often based on the change consequent upon placebo treatment rather than the marginal difference between placebo and untreated control. Natural remission of the disease and regression to the mean are suggested often as possible alternative explanations of the beneficial effects observed.2 9 10 In the present study, the important comparison between placebo treatment and non-treatment (observation only) in those RCTs that included active, placebo and untreated groups showed that placebo (ES 0.51, 95% CI 0.46 to 0.55) was superior to untreated control (0.03, 95% CI −13.0 to 0.18), thus supporting a true positive effect from placebo. This result was supported by the study by Hrobjartsson et al,37 where the ES for pain relief between placebo and untreated control was 0.25 (95% CI 0.16 to 0.35).37 The slightly greater effect (0.51–0.03 = 0.48) in our study suggests that the placebo effect for pain varies between conditions. Combining data from different conditions to examine the placebo effect for the same outcome (eg, pain) must therefore be undertaken with caution. Furthermore, in 14 non-treatment control groups 7 in fact did receive some minor intervention, such as education and lifestyle advice, and 7 had “usual care” or no intervention (truly untreated); in these 2 groupings the ES was 0.03 (−0.23 to 0.29) and 0.06 (−0.09 to 0.21) respectively. This suggests that the non-treatment controls included in this analysis reflect the situation of no intervention in real life practice and it is less likely underestimated. The degree of blinding is another challenge to studying the placebo effect. Even when a non-treatment control group is included, it is suggested that any additional effect of placebo over the non-treatment group cannot necessarily be attributed to placebo because of the difference in blinding between treated and only observed groups.9 The placebo effect may be overestimated, especially in a three-arm trial when patients receiving placebo do not know whether they are treated by active treatment or placebo. To test whether blinding affects the placebo effect we compared the blinded placebo (ie, patients did not know whether they were given active treatment or placebo) with the open placebo (ie, patients knew they were taking placebo). The ES was 0.52 (95% CI 0.47 to 0.57) for the blinded placebo and 0.30 (95% CI 0.10 to 0.50) for the open placebo, indicating that blinding may affect the placebo effect. However, further studies directly comparing these two scenarios with formal assessment of the degree of blinding are needed. Whether placebo is only effective for subjective outcomes remains controversial.5 38 Cross-disease comparison is problematic because of different pathologies and outcomes but in this study we examined subjective and objective outcomes in the same condition. We found placebo to be effective in all subjective outcomes (not just patient-centred (eg pain, stiffness, self-reported function) but also observer-centred (doctor global opinion)), but ineffective for almost all objective outcomes (eg quadriceps strength, knee circumference, range of movement, radiographic narrowing). However, care must be taken when interpreting these results. For example, for joint space narrowing, the studies were placebo controlled trials for glucosamine sulphate (knee OA, 3 years),39 40 chondroitin sulphate (knee OA, 1 or 2 years)41 42 and avocado soybean unsponifiables (hip OA, 2 years).43 The primary outcome of these trials was structural change (joint space narrowing) and secondary outcomes included pain and function. All trials apart from one43 showed significant joint space narrowing during the study period with placebo, but not with glucosamine sulphate or chondroitin sulphate. Unfortunately, there were no observation groups (ie, untreated controls) in these RCTs to know whether narrowing of joint space on placebo was slower than expected. 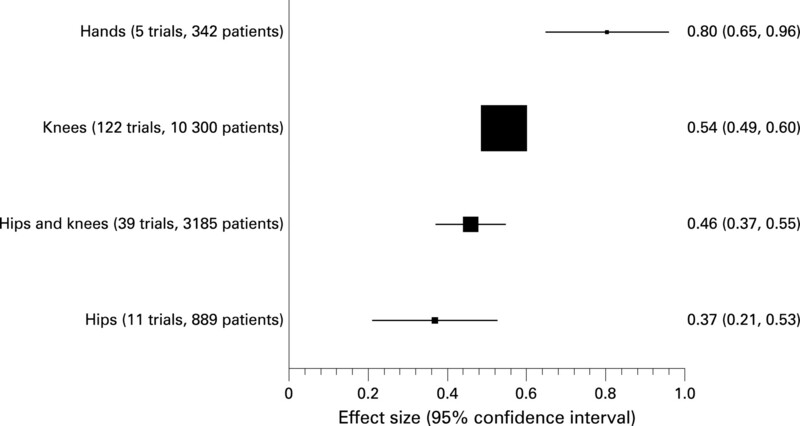 The effect size of placebo increased in line with the effect size of the active treatment. This supports the theory of “placebo analgesia”; that is, placebo is effective as an analgesic and the magnitude of the effect is determined largely by the expectation of the patient.12 We found that the placebo effect for drugs was greater than that for non-drug therapies, and this became even larger when the placebo for drugs was given by injection (fig 4). Furthermore, the placebo for opioids was superior to the placebo for herbals, and the placebo for new treatments (eg, coxibs) or topical treatments tended to be more effective (fig 4). All these results suggest that the placebo effect is strongly influenced by what the patient is told about the treatment; the greater the expected strength of treatment the greater the placebo effect. Baseline pain has been considered as a predictor for placebo response. Either low or high baseline pain may reduce this response.44 In our analysis, we found a positive relationship between baseline pain and the placebo effect. In part this may be due to the fact that baseline pain levels in this group of RCTs were moderate, ranging from 35% to 70% on a 0–100-mm visual analogue scale (VAS) (table 2): an ideal therapeutic window for the dose–response effect of minor analgesics and placebo analgesia. One recent RCT found that sham acupuncture (needle placebo) is superior to an oral tablet placebo in patients with arm pain.45 Our analysis for OA supports this observation in that sham acupuncture produced a greater effect size than the average placebo effect. In addition, we found a similar placebo effect for intra-articular hyaluronan injection (fig 4). Although topical placebos (topical herbals or NSAIDs) had numerically greater ES than oral placebos (oral herbals or NSAIDs) this difference was not statistically significant (fig 4). It is not surprising that sample size relates positively to the placebo effect. The benefit from a treatment relates to a combination of active effect and patient expectation (placebo) and if there is a large placebo effect a larger study is required to statistically separate active treatment from isolated placebo effect. Conversely, with a smaller placebo effect separation from treatment is possible with a smaller sample size. This is supported by the funnel plot (fig 1), which showed asymmetric distribution for placebo but not for active treatment (data not shown), suggesting that the publication bias may be more dependant on the placebo than the active treatment. The smaller the placebo effect in a trial, the greater the opportunity to publish a positive treatment effect. A relationship between the magnitude of placebo effect and the target joint was detected in descending order of hand, knee, combined knee and hip and hip only (fig 5). This relationship was confirmed in a subgroup analysis with the same drug treatment (ie, coxibs), but was not confirmed in the meta-regression analysis taking into account other possible covariables (table 3). Therefore, whether the placebo effect varies according to the target joint remains uncertain, although the hierarchy generally mirrors disease “severity”, the prognosis of OA and the ability to obtain successful treatment benefits. Further study of this possible differential response to treatment and placebo is warranted. There are several limitations to this analysis. Firstly, the placebo effect was largely determined as the difference between baseline and endpoint, rather than the difference in benefit between placebo and non-treatment (ie observation only) groups. However, although only three trials had placebo and non-treatment groups these did confirm the effect of placebo but not of observation only, thus supporting the placebo effect and justifying the subsequent analyses of placebo based on improvement from baseline. Secondly, like many other meta-analyses, we used study-level variables for the regression analysis so the sensitivity of the analysis may be lower than it should be. Consequently we may have missed some significant determinants. Thirdly, some categorisations such as degree of blinding and concealment may not have been undertaken accurately because of limited information provided in published reports. Clearly, we could only take data at face value as reported by the authors, even though this may not always have reflected the true circumstances of the study. Finally, heterogeneity occurred in most of the groups. Although we explored the reasons for this before we pooled data, most analyses still used a random effects model and the reasons for heterogeneity remain unknown. In conclusion, this study confirms that placebo is effective for OA, especially for subjective outcomes such as pain, stiffness, self-reported function and doctor’s global assessment. Important determinants of the magnitude of effect appear to be the baseline severity, the expected strength of the treatment, the route of delivery and the sample size. We would like to thank IDEA AG Munich for an unrestricted grant to undertake this work; the Arthritis Research Campaign UK for infrastructure support (ICAC grant 17696); and the European League Against Rheumatism (EULAR) and Osteoarthritis Research Society International (OARSI) for financial support to undertake literature searches used in this study.
. Are drug and placebo effects in depression additive? Biol Psychiatry 2000;47:733–5.
. Is the placebo powerless? An analysis of clinical trials comparing placebo with no treatment. N Engl J Med 2001;344:1594–602.
. A meta-analysis of the placebo response in acute migraine and how this response may be influenced by some of the characteristics of clinical trials. Eur J Clin Pharmacol 2006;62:161–72.
. The placebo response in the treatment of chronic fatigue syndrome: a systematic review and meta-analysis. Psychosom Med 2005;67:301–13.
. Placebo response in asthma: a robust and objective phenomenon. J Allerg Clin Immunol 2007;119:1375–81.
. Evaluation of the placebo effect and reproducibility of blood pressure measurement in hypertension. Am J Hypertens 2001;14:546–52.
. The placebo effect in irritable bowel syndrome trials: a meta-analysis. Neurogastroenterol Motil 2005;17:332–40.
. Immediate placebo effect in Parkinson’s disease – is the subjective relief accompanied by objective improvement? Eur Neurol 2006;56:222–9.
. What are the main methodological problems in the estimation of placebo effects? J Clin Epidemiol 2002;55:430–5.
. Concept of true and perceived placebo effects. BMJ 1995;311:551–3.
. The placebo is powerful: estimating placebo effects in medicine and psychotherapy from randomized clinical trials. J Clin Psychol 2005;61:835–54.
. A comparison of placebo effects in clinical analgesic trials versus studies of placebo analgesia. Pain 2002;99:443–52.
. Epidemiology of hip and knee osteoarthritis. Epidemiol Rev 1988;10:1–28.
. OARSI recommendations for the management of hip and knee osteoarthritis, part I: critical appraisal of existing treatment guidelines and systematic review of current research evidence. Osteoarthritis Cartilage 2007;15:981–1000.
. Glucosamine, chondroitin sulfate, and the two in combination for painful knee osteoarthritis. N Engl J Med 2006;354:795–808.
. A randomized placebo-controlled trial of arthroscopic lavage versus lavage plus intra-articular corticosteroids in the management of symptomatic osteoarthritis of the knee. Rheumatology 2003;42:1477–85.
. Debridement and lavage for osteoarthritis of the knee. N Engl J Med 2002;347:132–3.
. Nutritional supplements for knee osteoarthritis – still no resolution. N Engl J Med 2006;354:858–60.
. Assessing the quality of reports of randomized clinical trials: is blinding necessary? Control Clin Trials 1996;17:1–12.
. Fitting continuous models to effect size data. J Educ Stat 1982;7:245–70.
. Statistical power analysis for the behavioral sciences, 2nd edn. Hillsdale, New Jersey, USA: Lawrence Erlbaum Associates, 1988.
. Intra-articular steroids in osteoarthritis. Rheumatol Rehab 1980;19:212–17.
. The efficacy of intraarticular steroids in osteoarthritis: a double-blind study. J Rheumatol 1980;7:850–6.
. Intra-articular triamcinolone hexacetonide in knee osteoarthritis: factors influencing the clinical response. Ann Rheum Dis 1995;54:379–81.
. Corticosteroid injection in hip osteoarthritis: a randomized double-blind placebo-controlled trial. Arthritis Rheum 2006;54:S674–5.
. Effects of joint lavage and steroid injection in patients with osteoarthritis of the knee – results of a multicenter, randomized, controlled trial. Arthritis Rheum 1999;42:475–82.
. Safety and efficacy of long-term intraarticular steroid injections in osteoarthritis of the knee: a randomized, double-blind, placebo-controlled trial. Arthritis Rheum 2003;48:370–7.
. The powerful placebo. J Am Med Assoc 1955;159:1602–6.
. Is the placebo powerless? 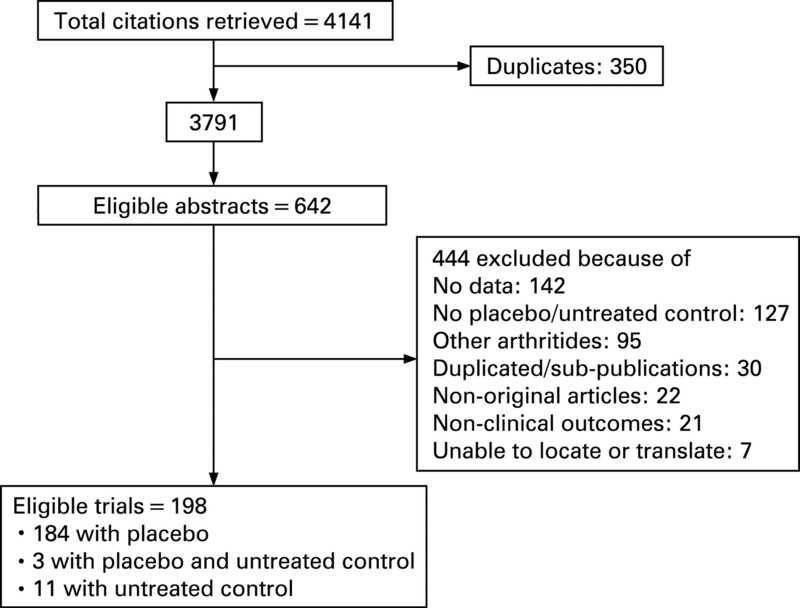 Update of a systematic review with 52 new randomized trials comparing placebo with no treatment. J Int Med 2004;256:91–100.
. Review: placebo is better than no treatment for subjective continuous outcomes and for treatment of pain. Evid Based Ment Health 2002;5:15.
. Glucosamine sulfate use and delay of progression of knee osteoarthritis: a 3-year, randomized, placebo-controlled, double-blind study. Arch Int Med 2002;162:2113–23.
. Long-term effects of glucosamine sulphate on osteoarthritis progression: a randomised, placebo-controlled clinical trial. Lancet 2001;357:251–6.
. Chondroitins 4 and 6 sulfate in osteoarthritis of the knee: a randomized, controlled trial. Arthritis Rheum 2005;52:779–86.
. Effects of oral chondroitin sulfate on the progression of knee osteoarthritis: a pilot study. Osteoarthritis Cartilage 1998;6:39–46.
. Structural effect of avocado/soybean unsaponifiables on joint space loss in osteoarthritis of the hip. Arthritis Rheum Arthritis Care Res 2002;47:50–8.
. The association between psychopathology and placebo analgesia in patients with discogenic low back pain. Pain Med 2006;7:217–28. Funding: This work was funded by an unrestricted grant from IDEA AG Munich, the Arthritis Research Campaign UK funded infrastructure support (ICAC grant 17696) and the European League Against Rheumatism (EULAR) and Osteoarthritis Research Society International (OARSI) provided financial support to undertake the literature searches. The full reference set of 198 trials used in this study can be provided upon request to the authors.